This kit comes in a shrink-wrapped end opening type box. I am no fan of this type of box, because invariably the decal sheet or parts find their way past one of the end flaps to become lost forever. Give me a tray and lid type box any day of the week. 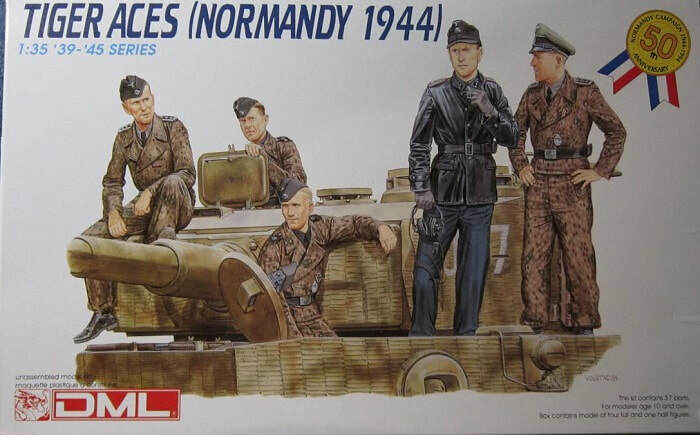 The box art shows 4 Tiger SS crewmen atop a Tiger tank that is covered with zimmerit. One figure is sitting on the mantle and is wearing a camouflaged uniform over low shoes. He has a black side cap on his head. The second figure is looking out of the top hatch and holding onto its door with his left hand. He is dressed the same as the first figure. The third figure is dressed in an all black uniform with a black peaked field cap on his head. He is holding a pair of headphones in his right hand. He is standing on the side of the Tiger's hull. 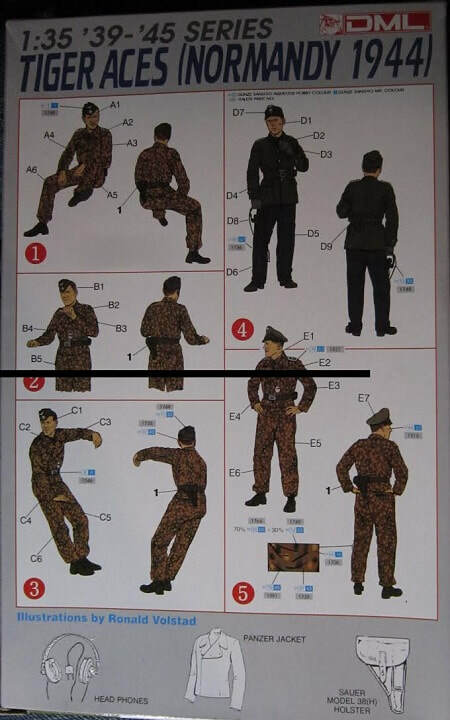 The fourth figure is standing and has his hands on his hips. He too is on the side of the Tiger's hull. He wears a camouflaged uniform and an officer's peaked hat. One corner of the box art says the kit is intended for modelers 10 years and older and it contains 37 parts. However, I only count 33 parts in the kit. Another corner of the box art has a badge that is commemorating the 50th anniversay of D-Day. One side panel of the box has 3 color box arts of other kits that DML manufactures: kit no. 6023, British Red Devils (Arnhem 1944), kit no. 6025, German Infantry (Battle of the Hedgerows 1944) and kit no. 6027, Pz.Kpfw. Panther II. ​The other side panel says that the kit contains parts for 4 figures and that paint and glue are not included, in 6 languages including English. This is followed by Marco Polo Import, INC's street address in City of Industry, CA and their FAX number. The copyright of the kit is 1994 and the kit was made in Hong Kong, China. The bottom of the box serves as the painting and assembly instructions. There is a 2-view of each of the four figures. Below these there are black and white line drawings of a pair of headphones, a Panzer jacket and a Sauer Model 38(H) pistol holster. All illustrations were done by DML's resident artist Ron Volstad. This kit contains one large light-grey parts tree. 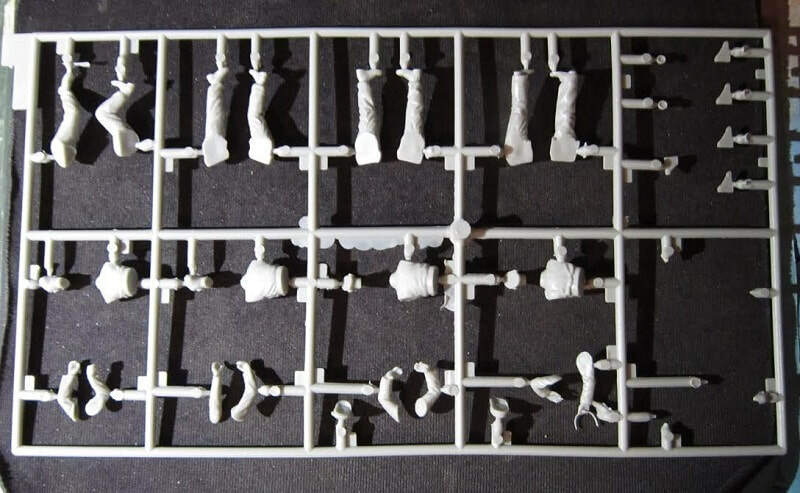 These are neat figures and will look great on a Tiger tank model.